Become a California Art & Home Featured Artist. 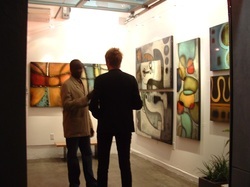 Become a California Art & Home Featured Artist and connect with designers and clients looking for your talents. * Artists listings are FREE. Just contact us and let us know that you would like to become a listed artist. Send us a picture representing your work and the contact information you wish to list, including your website. We will put it up as soon as we receive it and email you back when the listing is active. * If you have trouble sending a picture through the contact page, please use the contact page to let us know that you are having trouble and we will email you back with our direct email address for you to use. * Feature your work on your own page. With a short biography and contact information. * Have us feature you in our blog when you are having an event or create new work. You will also be featured on our Facebook page. * Artists pay to be featured artists on the California Art & Home website for three months at a time. When an artists three months are complete, the artist must update their subscription and content. This insures that the work and information is current. Artists that do not renew their subscription will be deleated from the featured artist pages. * A featured artists page is $75 for three months. Have us update your page with new work weekly if you would like. You may feature up to 20 pieces at a time. * You only pay if you would like your own page on California Art & Home. A simple listing is FREE. Submit new work and upcoming events to be considered for the blog anytime. Please include any information that you would like us to include in the blog.